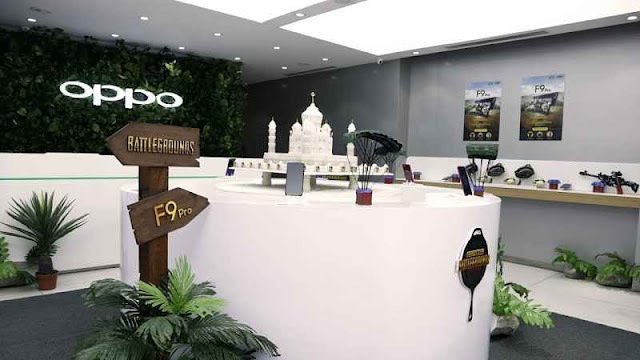 Oppo has unveiled its first public Themed Store in Bangalore. In a press statement released today, Oppo said that after receiving many entries from over 10,000 colleges and one-month action-packed tournament teams from 10,000 teams, OPPO has given this unique showroom to meet the youth of India. All new Oppo brand showrooms have been designed like the real battlefield from the popular game pub (Player unknown's Battleground). With the experience of the war, consumers will be able to truly experience PUBG's virtual world experience. Commenting on the launch of the store, Will Yang, brand director of Oppo India, said, "With great publicity among the youth, we are pleased to announce the improvement of our brand showroom on the basis of Pub. Our unique showroom Designed to meet the youth who are constantly following new and interesting trends in the market. By taking advantage of this partnership with Tencent Games, Oppo Youth Wants to strengthen its relations with the F-9 Pro is the perfect combination for an integrated and unique experience. " With the winner of the mega prize pool of Rs 50 lakh, OPPO also honored other participants of the month's long Pub Tournament on this occasion. The popular mobile game PUBG recently exceeded its latest landmark with over 100 million installations on Google Play Store. Games developed by Tenant Games, is currently one of the most popular mobile games available for smartphones, and has been particularly successful on the Android platform.